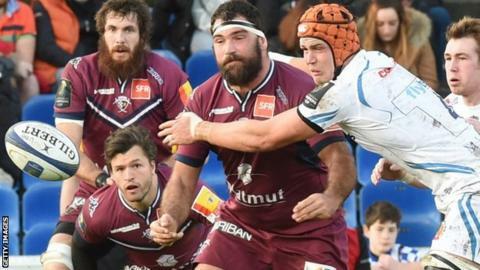 Exeter's hopes of making the European Champions Cup quarter-finals were dented by valiant defeat in an eight-try thriller against Bordeaux. An open first half ended level as Will Hooley's reliable boot - and Dave Lewis and Byron McGuigan's breakaway tries - made up for Exeter's sparse possession. Max Bodilly's superb long-range score kept Exeter in touch after the break. But, with Hooley in the sin bin, replacement Marco Tauleigne cantered in for the decisive score. Defeat leaves Exeter third in Pool Three, ahead of Bordeaux on points difference, three points behind Clermont Auvergne and five off leaders Ospreys, who they meet at Sandy Park next weekend. However, Chiefs coach Rob Baxter will be buoyed by the performance of a side that showed 13 changes to the one that beat Gloucester last weekend, with injured England internationals Jack Nowell and Geoff Parling, and longer-term absentee Henry Slade, among those missing. Bordeaux's determination to run the ball and offload out of contact posed a constant threat, but also allowed Exeter's second string plenty of opportunities to counter. After the hosts' Australian imports Blair Connor and Adam Ashley-Cooper had crossed in quick succession, McGuigan returned a kick with interest and offloaded for Lewis to burst over. Bordeaux's physical and well-drilled forwards enjoyed set-piece superiority throughout and Louis Madaule rumbled over from short range, only for Campagnaro to punish another aimless kick forward as he put McGuigan over. The second half was less expansive after the fireworks of the first and Bordeaux - fifth in the Top 14 - showed a clinical edge. Benat Auzqui shunted over from excellent New Zealander Hugh Chalmers' take in the line-out before Tauleigne ran through a depleted Exeter side to render Bodilly's dazzling score a footnote. Bordeaux-Begles: Buttin, Talebula, Ashley-Cooper, Rey, Connor, Bernard, Lesgourgues, Poirot, Avei, Gomez Kodela, Marais, Jaulhac, Madaule, Chalmers, Goujon. Replacements: Le Bourhis for Talebula (61), Serin for Connor (62), Beauxis for Bernard (53), Taofifenua for Poirot (50), Auzqui for Avei (50), Kepu for Gomez Kodela (50), Cazeaux for Jaulhac (63), Tauleigne for Goujon (45). Exeter: McGuigan, Woodburn, Campagnaro, Bodilly, Jess, Hooley, Lewis, Low, Taione, Brown, Atkins, Hill, Johnson, White, Horstmann. Replacements: Botha for Bodilly (73), Thomas for Lewis (73), Rimmer for Low (72), Malton for Taione (53), A. Hepburn for Brown (49), Skinner for Hill (56), Steenson for White (69).